Sometimes, you need to eat chocolate. In those moments, I almost always make a batch of easy chocolate pudding. I eat it while it’s hot, and it makes the most amazing dessert. I’ll never understand why people pay to buy pudding mixes with ingredients labels that require a chemistry class to decipher. Even when I wasn’t into Real Food, I still couldn’t bring myself to use boxed pudding mixes — not when such easy chocolate pudding recipes are out there. This easy chocolate pudding recipe is adapted from the Quick Chocolate Pudding found in More With Less (one of my top 5 recommended cookbooks). I’ve even sometimes adapted it so it’s dairy-free, and included that option in the recipe below. 1. In a glass measuring cup, whisk together arrowroot powder, cocoa, and milk until relatively smooth. 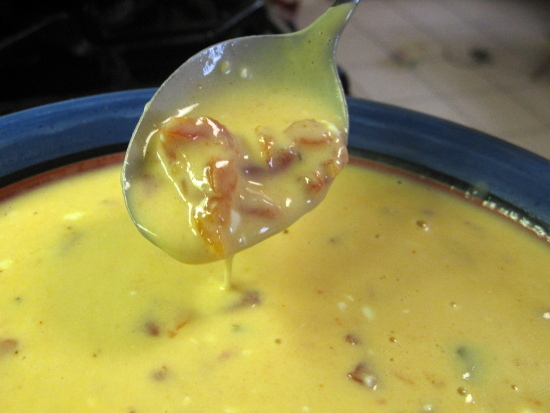 In a small saucepan, combine the honey and the milk mixture over medium heat. Cook until thickened, stirring constantly. 2. Once thickened, remove from heat, stir in vanilla and butter until evenly distributed. 3. Serves 4-6. 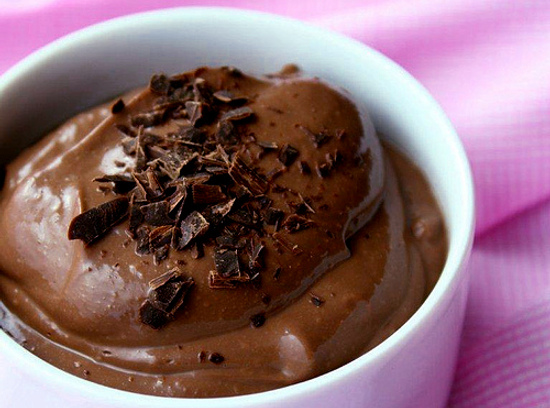 Enjoy your tasty, warm, gooey, relatively healthy, and definitely easy chocolate pudding! Sounds delicious! I didn’t realize how easy homemade pudding was, so I think I’m going to try this one out this weekend. I was just wondering if there’s a taste difference between using milk or coconut milk. .-= K @ Prudent and Practical´s last blog post …More Pancakes! =-. Definitely! There’s even a slight texture difference between using arrowroot powder and corn starch. If you want the more “traditional” pudding texture and taste that you get in pre-packaged puddings, you’ll want to use the corn starch and milk. Arrowroot powder works well to thicken it up, but it comes out even smoother/stretchier. (Wish I knew the right word to describe it! It’d be obvious if you put them side by side. And coconut milk definitely has the flavor of rich, creamy coconut in it. But, it’s dairy-free for those who need/want to prepare food that way. Just want you to know that all honey is cooked unless you buy it raw on purpose. The only way to get honey to a stirrable texture is to cook it. Or else its a semi-hard wax. All honey will always have a toxic property, but only to children under 7 months old. I read the back of a box of pudding once and have been making my own ever since… with different ratios of starch/chocolate/sugar/milk… just doing it by taste. This recipe turned out way better than my haphazard backwards engineering. Something to note: I found the addition of butter rather curious and I forgot to do it until I was about to pour the last bowl. I added a little to taste what difference it would make. It gives the pudding an even silkier finish, amazing. I would not skip this step in the future. I used brown rice syrup since I avoid eating heated honey, almond-cashew milk, arrowroot powder, and doubled the cocoa for more bitterness. I can’t believe how easy it is to make this! I was wondering if you’ve ever frozen it in popsicle form? I bet it would have a great texture, with all that “pudding-ness”! I’ve never frozen it into popsicles. I wonder how that would turn out! Just made this with the cornstarch and milk and it’s great! Thanks so much! 4 to 6 servings? Surely you jest! LOL!! That does sound delicious and easy to make even after a tiring day at work. Do you think this would work with goat’s milk? haha. It’s just that my husband and I would gladly eat the coconut milk, but my little boy says he is allergic to coconut. I trust his instincts about that, so I don’t give him coconut things without telling him. He usually tries it and then doesn’t like it. I swear he can taste coconut when others can’t. Anyway, I’m not supposed to have dairy at the moment (need to do some gut flora rebuilding, I guess. not sure how to put it, but I’m thinking raw milk would be good…. that’s research for another time, though!). .-= hippygirl´s last blog post …Gluten and Dairy free chicken fried steak =-. Someone below commented on using almond milk. Maybe give that a try? 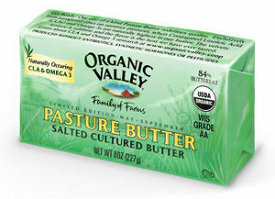 .-= Elizabeth @ The Nourished Life´s last blog post …Want to Give Grass-Fed the Credit It Deserves? Here’s Your Chance =-. Had to add this to my delicious online “cookbook.” Can’t wait to try it! .-= A Green Spell´s last blog post …Happy Earth Day! =-. Dang, that looks good! I was this close to being over dessert, too! .-= Ren´s last blog post …Fideo con Pollo =-. I just made the coconut/arrowroot version…lovely and smooth and rather quite nice – only put in a small amount of honey as it was all I had…but still I’ll make it again…bet the kids will inhale it! Do you have to use liquid honey in this? I suppose the solid would stay liquid if you ate the pudding warm. That’s another question…..you mention eating it warm-is it good cold too? I’ve only ever tried it with liquid honey or dry sucanat. And yes, it’s great cold, but you should probably cover it tightly with plastic wrap to keep it from forming a thick film on top of it. Wow that is really good. Would it make a good vanilla pudding if you were to leave the chocolate out? I don’t know. You’d probably have to majorly tweak the recipe since you’d be reducing the dry ingredients by so much. You should experiment and let us know how it turns out! I don’t see why it wouldn’t. It’d have a different flavor and texture, but it sounds like it would be yummy! I’m not crazy about the honey taste, so I’ll try sugar or such next time. Also, I didn’t have cocoa powder, so I subbed unsweetened chocolate squares. Texture much like pudding from a box. .-= Rachael´s last blog post …Chocolate Pudding =-. I always laugh about the fact that my favorite thing on the planet is so white trash–pudding in a pie shell. I just absolutely love chocolate pudding. I’ll have to try this! Also good as a “fondue” dip if you use a little less arrowroot. We’ve probably made this a half dozen times since you posted! One of our new favorites, along with probiotic kefir ice cream. Looks amazingly delicious. I can’t do chocolate or starches right now but it sure makes my mouth water! .-= Sarah Schatz – menu plans for limited diets´s last blog post …Life before and after the GAPS diet =-. This looks amazing!! For the coconut milk, do you suggest using (full-fat) Canned coconut milk or the coconut milk in the carton? If it is the one in the carton (thinner version), would almond milk work too? Thank you! This is terrific! I’m so grateful you posted a good chocolate pudding recipe. Hubby said it tastes just like the real thing (and he’s picky). I added raw cacao butter to mine, and opted for coconut milk. It’s fantastic. This is delicious! Hubby and I love this for a quick treat. I wasn’t sure what to expect with this recipe because while I love all things coconut, I’m not much of a honey fan and worried this would taste like honey and nothing else. Boy was I wrong. This is AMAZING! It tastes so smooth and rich! I followed the recipe exactly and I’m so glad I did. It’s not “in-your-face-honey” at all, it’s rich, velvety chocolate heaven! I haven’t found a bad recipe on this site yet. Thanks so much! Help! I made this tonight, but tried cutting everything in half because it was just for me. I got chocolate soup is all 🙁 Did I not cook long enough??? Used whole milk and arrowroot, cooked until it started to boil and I thought I smelled it burning. Did I give up too soon?! It had great taste, but literally soup. How long do you cook over medium heat until yours thickens? We make vanilla pudding all the time. And I always add in a few egg yolks at the end (temper them first! ), and often stir in flaked coconut. Yum. I just made this and it is AMAZING!!!! I used chocolate almond milk and coconut nectar for sweetner and it is so good!! Thank you for this recipe! It is one of my favorite desserts now:)I think it would make a great pudding pie in chocolate crust too! You’re a freakin’ genius lady. I made this for Christmas to keep myself happy and away from the egg-filled desserts. Every else loved it just as much as I did! I made minimal adjustments (and that’s saying a lot since I tweak everything) with great success. It’s a very adaptable recipe. We’re partial to maple syrup, so I subbed out the honey and used 1/2 cream 1/2 whole milk. DIVINE. I love it cold, since it reminds me of pudding cups. Mmmmm. I haven’t been up to making anything elaborate for V Day, and then this recipe just popped in my head. Luckily, I can whip it up in a few minutes and make my 4 year old a very happy girl. I’ll just keep telling myself that I’m a good mom, and I’m making it just for her. I just made this Chocolate Pudding. I made a few personal adjustments and it turned out great. I used carob instead of cocoa powder, 3 T of maple syrup and 3 small scoops of stevia instead of honey, coconut milk, arrowroot and a pinch of salt. My daughter and I loved it. The arrowroot does have a different texture, a little more mucus-y, but she doesn’t know the difference. Thanks for a great recipe. We will continue to use it. I made mine with carob and goat’s milk. Those were my only 2 adjustments to the ingredients. But I made a change in the process: I cooked it in a double-boiler. And it turned out thin. It was soo good in flavor though, that I think I will try it again and try just doing it on the stove top (my history with burning puddings is poor), and maybe it will be thick that way. I”ve been told that there is no difference with the way cornstarch thickens goat’s milk and cow’s milk. Can you sub coconut milk with raw fresh milk? I just bought some raw milk and want to try it in a chocolate recipe! I’m confused on the pudding recipe. Do I use coconut milk that is for drinking and is in the refrigerated section or coconut milk that is thick and is found in a can in the non-rerigerated section? You refer to Coconut milk, are you referring to the canned type where you see choices like “full fat” etc..or you talking carton type that are usually refrigerated? I have been experimenting with making my own puddings and am grateful to come across this recipe / post. Is there such a thing as organic tapioca? I have been using “regular” tapioca, as a previous attempt at using arrowroot did not go well for me. But, I am willing to try again. This should work with coconut milk in a carton or can, or almond or rice milk. I think Hemp milk would be too strong of a flavor. I made this and the taste was good. The consistency of the arrowroot pudding is more “slimy.” (I’m not saying this to knock this recipe, but it’s the most accurate description I can come up with.) My kids called it chocolate slime and were very happy with it! I used regular cocoa powder (not dark) and increased it to 3 TB. Instead of honey, I used Stevia in the Raw & it turned out fine. Also, I used light coconut milk and didn’t taste coconut; the chocolate overpowered it nicely. The chocolate flavor was very good. I think it would be great to make as a Halloween treat and call it slime! I recommend that if you want the consistency of regular pudding, use cornstarch. I made this and it turned out like chocolate soup??? Thank you! I can’t tell you how many recipes I’ve clicked through trying to find a real food chocolate pudding recipe that doesn’t have weird ingredients that don’t belong in pudding (avocados, chia seeds, bananas, dates, etc)! I’m looking forward to making this for snack tomorrow! This turned out really well! My kids gobbled it up & even said thank you, lol. I did use Sucanat instead of honey but followed everything else exactly. Great recipe! I just tried this recipe and…unfortunately…the texture of this was definitely slimey and gummy! The taste is okay, but the texture makes this kind of disgusting, to be honest. My boyfriend agrees about the unpleasant texture; next time I will reduce the amt of arrowroot or use cornstarch instead. Thanks anyway for the recipe, but I think it’s important to warn others about the major textural difference. Mine, also turned out slimey and I ended up throwing it out. The taste was good, but, not the texture. I thought, maybe, I did something wrong. This did turn out really runny and did not thicken for me (as I see others had happen as well)… I spent 25 minutes stirring it on the burner so it was very frustrating… I saw someone else suggest the Popsicles so I put it into the molds and they turned out great! Mildly sweet and delicious! I did have some left so after sitting in the fridge over night it did thicken.. So you could make it ahead of time and serve cold if you like it more of a pudding texture. I made this recipe using milk, corn starch and rice malt syrup. The texture was a little different to the sugary puddings I’m trying to stay away from, but it was still delicious and satisfied my sweet tooth. I will save this recipe for the future. Thanks a bunch! This is very good, thanks for posting. I did substitute sucralose for honey and added 1/2 oz of baking chocolate for part of the cocoa and butter. I also tried it with kefir instead of milk, but I did not like the taste and will use milk or coconut milk in the future. I bet I could use chia seeds instead of the arrowroot to thicken. I wish someone would tell me the point of using raw honey if you’re just going to heat it?!?! Not sure what happened to my chocolate pudding but when I added the honey and vanilla, it turned liquid again? I cooled it and it never to thick? So I reheated it with 2T more of arrowroot and then it was yummy. Any thought as to why it didn’t stay think the first time? I randomly found this post while searching for a quick, healthy pudding recipe. I just have to say, I LOVE your hat! As a wapf-eating, eco-farming mom myself, I adore a good hat. I haven’t figured out how to take a good pic with one on, so kudos for that too.